Has it really been almost a year since season three? I MISSED YOU GUYS. The Hulu Theater at Madison Square Garden was like a rock concert! Each time our beloved characters first appeared on the screen the audience broke out into applause and cheers. 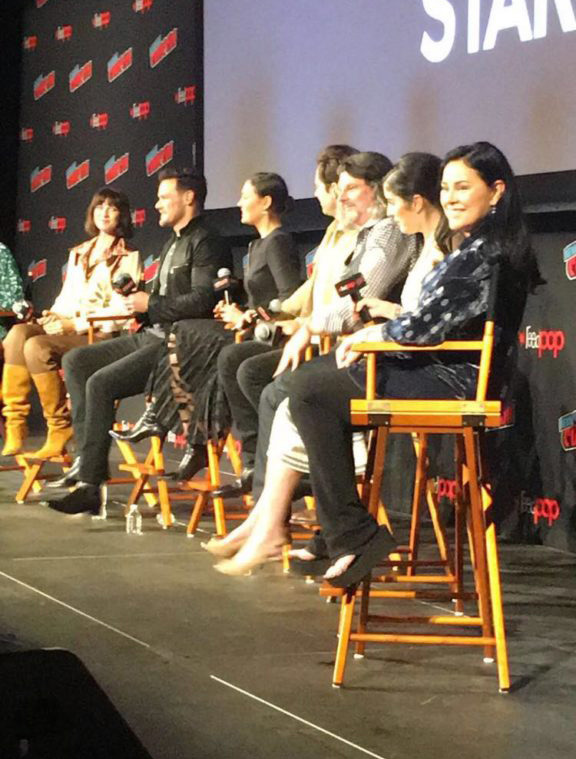 Outlander fans at New York Comic Con were READY for the first episode of season four, and the show did not disappoint. I’m going to do my absolute best to not spoil anything from the episode for everyone. I’m going to be completely honest with you. I’m not sure it’s completely processed yet that I was literally feet away from the even-more-gorgeous-in person cast and crew of Outlander yet. As the episode screening ended I fought my way through throngs of determined Outlander fans, all of us edging to get close to the front of the stage as the moderators announced that they had six minutes to take fan questions. Questions both silly and serious kept flashing through my head as I kneeled triumphantly on the floor smack dab on the right side of the panel. Of course, that was right around when the moderator announced that they couldn’t take any more questions. Droughtlander may always feel like forever, but those six minutes sure didn’t! It’s easy to see how easy the cast and crew get along with each other in the live streams of panels online, but the camaraderie between all of them was even more evident and heartwarming in person. I loved the moderator asking Richard and Sophie if their relationship was, as a fan put it, like a comfy pair of shoes. Kudos to the moderator, Ms. Lola Ogunnaike for clearly being a fan of the show and handling the entire panel with effort and ease. I’m sure I’m not the only one who would love to see her moderate more Outlander panels. Special credit goes to her for diffusing the tension into what could’ve been an awkward hot minute or so after a fan asked a somewhat controversial question. ( I was interested in the varied response to this now infamous fan question on Twitter, with some fans saying that it was uncalled for, to others expressing frustration that the women on the panel (Caitriona, Sophie, Maril, and Diana) didn’t appear to have a chance to answer the question. What do you think Outlander fans? Should political questions be allowed at cons? Should there be a con-question etiquette? I hope the fan in question doesn’t feel bad about it. I personally thought it would’ve been better suited to an interview where the cast has more time at their leisure to mull it over and respond. I was still mid-tweet when the Ms. Ogunnaike announced that the panel was over. Thankfully everyone was exiting in my direction (score!) so I had the chance to try with all my might to get someone in the cast to notice me. I joined fellow fans in shouting (politely of course) “Happy Birthday Caitriona!” She smiled and waved and graced my phone camera with her presence. I was also immensely impressed with Sophie Skelton, who sweetly stayed behind and did her best take selfies with as many fans as she could who were up front. I was literally a second away from asking her for a selfie when security finally ushered her away. She mouthed apologies to us (and to me personally, I’m convinced) and I was left staring at the empty stage wondering if all of that had really just happened. 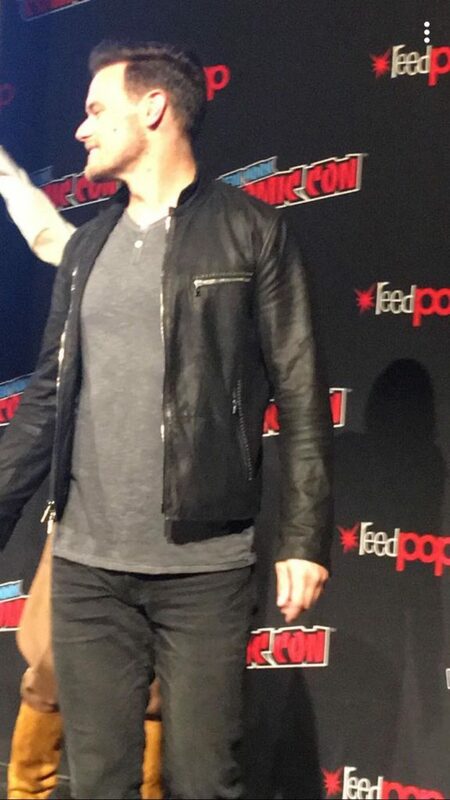 To say that attending that panel was pure magic would be an understatement. Outlander fans are truly one-of-a-kind, and I was so happy to be able to share in everyone’s excitement. I hope everyone reading this has a chance to attend a convention and experience that euphoric Outlander joy that I felt on Saturday. I wasn’t kidding when I tweeted that you should pour yourself a nice glass of whiskey when you watch the season premiere. It’ll certainly help drown out your tears. The question is you be crying tears of joy or sadness? 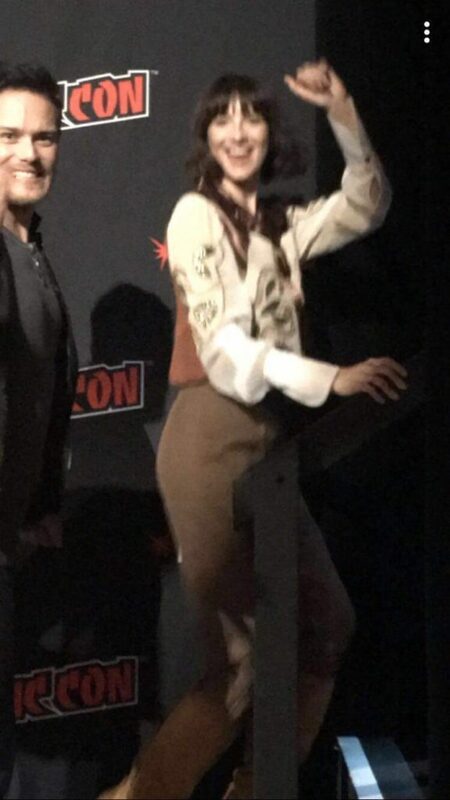 This entry was posted in Caitriona Balfe, Diana Gabaldon, Maril Davis, New York Comic Con, Richard Rankin, Ronald D. Moore, Sam Heughan, Sophie Skelton and tagged Caitriona Balfe, Diana Gabaldon, Maril Davis, NYCC, Richard Rankin, Ronald D. Moore, Sam Heughan, Season Four, Sophie Skelton by Katherine Stinson. Bookmark the permalink.